We are going to have KOTO concert at our Lobby on friday night(not every friday). The KOTO is a tradditional Japanese stringed musical instrument derived from chinese zithers. Koto makes sounds very beautiful and elegant . last year there are many guest come for this concert after the concert you can tough the KOTO and try to play! The charge is free and everyone can come and join the concert. The concert is not every friday nights so please ask to the recetion. we hope many people enjoy japanese traditional music in Japan. As we wrote last time, we enjoyed Daimonji on 16th night. Thank you for joining us and we hope our guests enoyed it! We had more guests attending a meeting than we excepcted. then more and more guests joined! They enjoyed talking with the guide also with other guests. After the meeting, we went up the roof to watch Daimonji. Many people came there, not only the guests staying at our ryokan but also the guests staying at another ryokan. These letters are to be able to watch from our roof. It was too far to take pictures. The real one is closer. It used to be able to watch 2 more letters but more high buildings have been built now a days, so we cannot watch them very much. Even though I felt summer in Kyoto. How about our gusts? I hope they did! 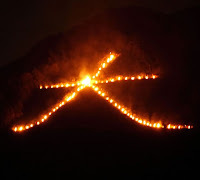 daimonji okuribi is a fire lit to send the souls of deceased ancestors on their way after they have returned to this world for the bon festival. In the Daimonji okuribi festival ,5 mountains are used as the stage for an okuribi of huge proportions. The festival starts at 8:00pm. Our hotel guests can enjoy this Daimonji okuribi from our Hotel roof. we can watch 3 okuribi also we are going to have English speaker interpreter at our lobby from 18:00pm. so If you do not know about this festival he can teach you in English and after that you can go up to our hotel roof and enjoy Daimonji Okuribi . August 1st was one of our guests' birthday. He has been staying here for almost one month! He is in Kyoto to study Japanese going to school. We meet him every day and practice Japanese with him sometimes. Now, we feel like he is our friend. He is probably the first one staying with us such a long period. We appreciate him for choosing our ryokan. What I like is to talk with our guests. I am interested in where our guests come from, what is their city like... I also like to help them and hope to make their trip unforgettable. If you come to Hotel Nishiyama, please do not hesitate to speak to us!